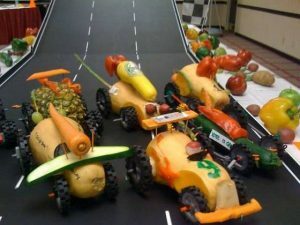 In Spud Racer, the object of the event is to build the winning racecar made mainly from fruit, vegetables and the materials provided! At the start of this event, participants are placed onto teams and are given a bag of materials such as wheels and axles, toothpicks, and knives. 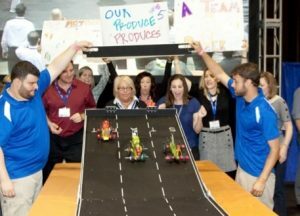 Teams send representatives forward to choose from a display of fresh fruits and vegetables that may be used for constructing their racecar. Throughout the building phase, teams can test their racecar on the custom-built tracks, which will remind participants of their pinewood derby days. Once their cars are ready to go, it’s time for the races! The winner from each race moves on to the next round until there’s one winner! 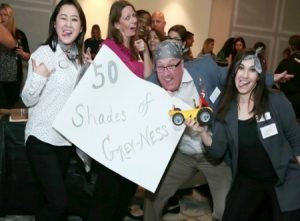 In the end, three categories of award medals are handed out – The Berry Best award for the winning racecar, the 24-Carrot Creativity Award, and the Lemon Award to the team whose racecar was the most disastrous.